Week 2 of the Breezy Willow summer CSA: kale (good grief, if you combine this with the end of the spring CSA, this made the third or fourth week straight of kale), zucchini, spring onions, blueberries! 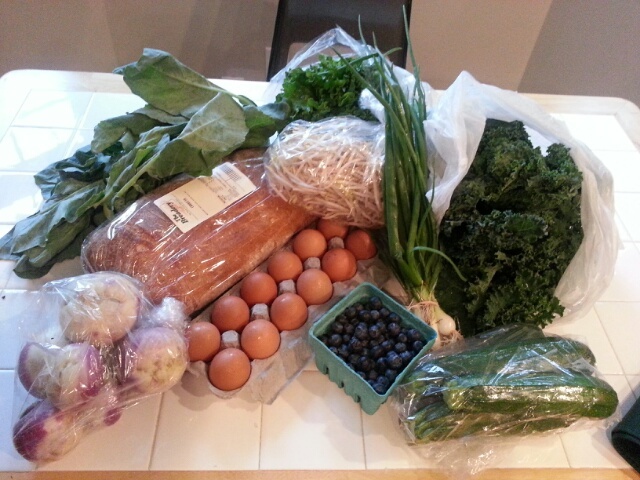 delicious blueberries!, bean sprouts, green leaf lettuce, kohlrabi, turnips, eggs, and bread (Breadery ciabatta). The zucchini was sliced and sauteed right away to go into lunches. The blueberries, of course, disappeared rapidly, and they would probably have been completely eaten on the very first evening if I hadn’t hidden the rest of the box from the kid. For the kale, I used Cook’s Illustrated recipe for “Blanched Assertive Greens with Bacon and Onion”, which is a constant favorite in our household. The spring onions got chopped up with spring scallions and spring garlic (thank you, East Columbia farmer’s market, for selling me items I didn’t even know existed! 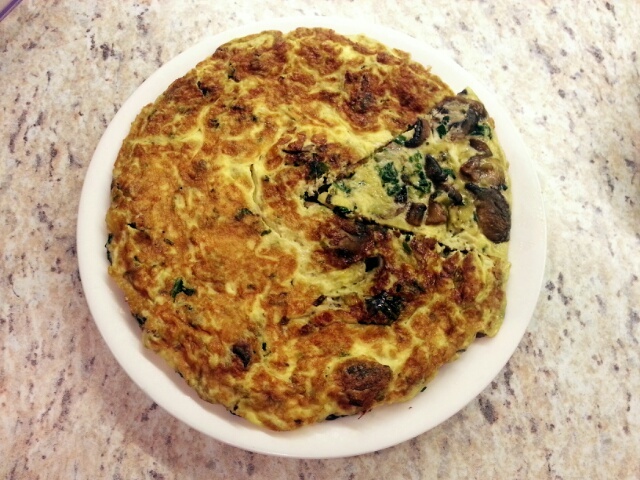 ), and were sauteed with radish greens and mushrooms (both from last week’s share) in a lovely frittata. At least I hope it’s lovely. The filling tasted good, anyway, before I poured eggs and gruyere cheese all over it. The picture looked boring, so to create some contrast, I flipped one slice of it upside-down. “Looks like Pac-Man,” was K’s verdict. Anyway, frittatas are one of my go-to recipes for using up CSA stuff. Just saute everything, bind it all together with egg and cheese, cook it on the stovetop until the bottom is firm, stick it in the oven until the top is firm. Use a nonstick pan so that it’ll come sliding out easily; serve over rice or with bread. Easy dinner. Or lunch, in this case. As for the bean sprouts, kohlrabi, and turnips… they’re still in the fridge. I was pondering making latkes with the kohlrabi and turnips, but it hasn’t panned out yet. Alas, the sprouts may not be doing well after all this time. And we’re getting more vegetables this afternoon. At least there isn’t supposed to be any more kale.